I'm off to Comic Con 2015. I'll have lots to share when I return, but there's something I'm busting to tell you about before I leave. This is a web series starting in September brought to you by Firefly peeps, Alan Tudyk and Nathan Fillion. It's loosely (or not so loosely) based on actors who starred in a science fiction show that was cancelled after a single season but has gone on to become a cult classic. Hmm? Can you say Firefly? 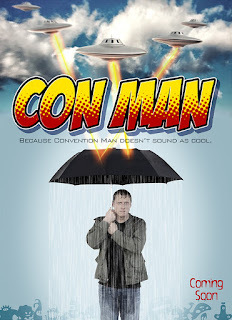 It was successfully funded by an Indie Go Go campaign and I'm telling you, if you want to belly laugh and roll on the floor - go to the CON MAN Indie Go Go page and watch ALL the videos. If I don't come back from Comic Con with a Con Man t-shirt, then I have not done my job. Is there a web series out there that you are dying to share? I'm telling you, the videos on their Indie Go Go pages are hilarious. Bet it will be awesome. Be a little like Galaxy Quest. Thanks, Alex. Can't wait to see what Force Awakens goodies are in store. Have fun at Comic Con, my friend! Any web series I've watched have been on Netflix--not sure if those count! Hope you meet lots of great celebs at comic con. This has an interesting premise and I like a good laugh. I'm waiting for you to show me your T-shirt and a few pictures of you having fun. Looking forward to reading about your visit. Hope you had a great time!